Putney was called Putelei or Putenhie in the Domesday Book of 1086, which recorded that the village obtained 20 shillings from a ferry or market toll. In 1855, it became part of the Wandsworth district of Surrey and was included in the new county of London in 1889. It has formed part of the London Borough of Wandsworth since 1965 when the now defunct Greater London Council replaced London County Council. The ferry mentioned in the Domesday Book also crops up in the household accounts of Edward I (1272–1307). Robert the Ferryman of Putney and other sailors received 3s 6d (17½p) for carrying the royal family across the Thames and for taking the King to Westminster. During the English Civil War, between the Royalists of Charles I and the Parliamentarians led by Oliver Cromwell, a series of meetings about a new constitution for England, known as the Putney Debates, began at the Church of St Mary the Virgin in 1647. They were organised by members of Cromwell’s New Model Army, which had set up its headquarters in Putney, and included a number of members of the Levellers, a political movement advocating popular sovereignty, extended suffrage and religious tolerance. St Mary’s Church survives, beside the Thames on the south side of the present Putney Bridge, amid modern buildings. The old Putney Bridge, which lasted for 157 years until replaced in 1886. 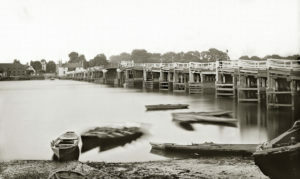 The first bridge between Putney and Fulham, consisting merely of a line of boats, was built in the first year of the Civil War, 1642, about 500 yards downstream of the present bridge. The first permanent crossing, completed in 1729, was only the second bridge across the Thames in London after London Bridge. It was a wooden structure and lasted for 157 years. In 1856, an aqueduct was built just upstream from the bridge by the Chelsea Water Company to carry drinking water across the river. It was demolished in 1886 when the old bridge was replaced by the present-day stone bridge, with water pipes running under the roadway. This is the starting point for the University Boat Race, one of Putney’s major attractions since the first half of the 19th century. Like many towns and villages, Putney expanded during the Industrial Revolution with the arrival of the railways and improved roads. Putney station, in the High Street, opened in 1846, served by trains trains from Waterloo. The present Underground stations, Putney Bridge, which is across the Thames in Fulham, and East Putney, were opened in 1880 and 1889, and were served by steam locomotives until electrification in 1905. Putney High Street looking north in the 1950s. 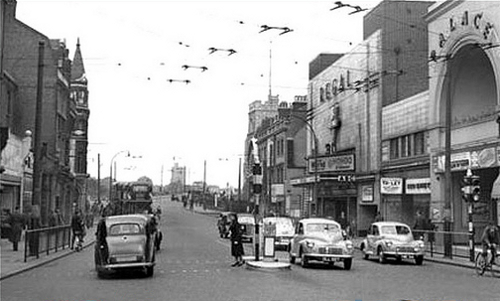 The two cinemas on the right have been replaced by a concrete building containing the Odeon. Visitors to Manor Fields are welcome to park here, so long as they display a valid temporary pass. You should ask your host to obtain a pass from the estate office. There is a large plan of the estate at the main entrance. 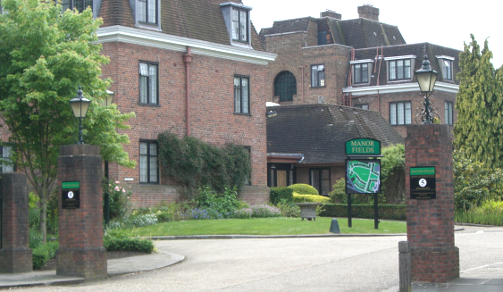 Flats at Manor Fields come up for sale or rent from time to time and are widely advertised on the internet, in newspapers and by estate agents in and around Putney. The estate office does not deal with sales or lettings. The company has made all reasonable efforts to ensure that the information on this website is accurate and up-to-date, but makes no warranty as to its accuracy, completeness or currency. Nothing on this website is a representation to any person nor overrides the provision of any contract between the company (or any predecessor in title) and any person. Hypertext links to other websites are for convenience only and the company does not endorse and is not responsible for the content of any other website.